Our developers have been working hard to make your wishes come true and have waved their magic wand on OnePageCRM to bring you Focus Mode. Focus Mode, with its magical powers, is the culmination of a few years of learning from you, our customers. Does your typical day start full of energy (aided with a coffee or two!) only to be brought to a halt when you get distracted? Fear not, the Focus Mode is to the rescue…. now you’re in control – you decide what you need to focus on today so you can get to work immediately. No more daunting long lists to make you feel overwhelmed as you begin your working day. How the Focus Mode works? 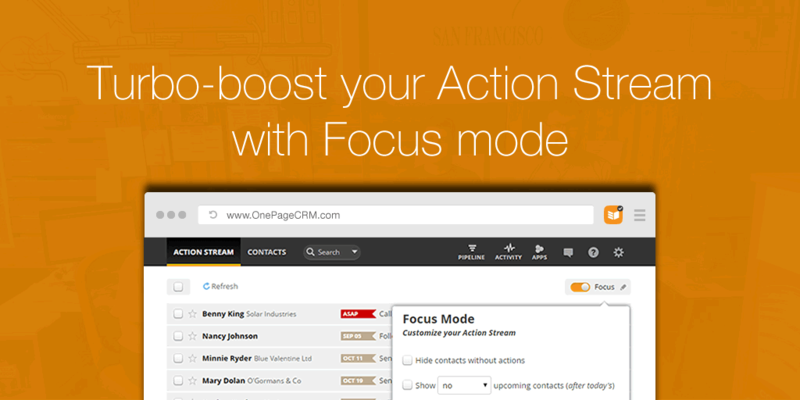 By enabling Focus Mode on your OnePageCRM account you can customize your Action Stream to keep you focused on only the contacts and actions you choose to work on today. To get started, you must first customize your settings. To do so click on the edit icon and select your preferred options and hit ‘Save and run’. Once you’ve them configured you can easily turn on / off the Focus Mode. Simply hit the ‘Focus’ button from your Action Stream and watch it turn orange when enabled! Easily turn it off by hitting the button again! Simple. Your Query: “We’ve finished selling to some contacts. I don’t want to delete them, but I don’t want them in my Action Stream either”. Our Solution: ‘Hide contacts without actions.’ The Focus Mode offers more flexibility so you can still keep your previous customers in your CRM without having them clutter up your Action Stream view. They are still easy to find and manage should you ever need to reference them again. This option was previously available under your Action Stream Settings, it now just has a new home! Your Query: “It’s overwhelming to always see the never-ending list of contacts with Actions”. Our Solution: ‘Show no (or limited) upcoming contacts.’ This setting will allow you to control how many upcoming contacts you see. You can now have a peek at tomorrow’s actions without feeling overwhelmed from the others in the future. Previously we had a setting for hiding upcoming contacts, but it was not as flexible as our latest enhancement, this setting offers you more control! Win win! Your Query: “My Action Stream is out of control with overdues and I just want to work on Today’s scheduled actions, I’ll get back to the overdues later”. Our Solution: ‘Hide contacts with overdue actions.’ is a brand new feature to temporarily allow you hide all contacts with overdue Actions. Now you have better visibility of the tasks at hand enabling you to increase your daily productivity. We automatically turn this filter off at midnight though, to make sure important actions don’t fall between the cracks! Remember: Take back control of your overdue actions by moving them to a date in the future (when you have more time) or mark them complete to remove them. You can do both in bulk. Read more here. Your Query: “My colleague is out, is there any way I can combine their Action Stream with mine for the day?”. There are plenty more examples like the above. It’s now in the hands of you, our creative users! Keeping on top of your Action Stream is critical to sales success. Now, the Focus Mode puts you back in control of what Next Actions are important to you. 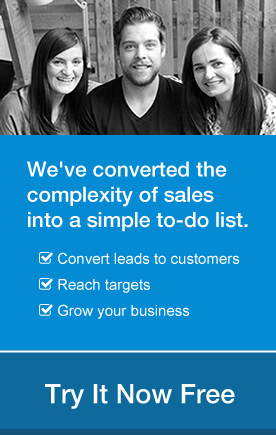 As with all our updates, we’re excited to hear how this improves your sales process. Let us know your feedback by tweeting us @OnePageCRM #AskOnePageCRM, comment below or contact me at evelynod@onepagecrm.com. Marketing Coordinator at OnePageCRM with a background in Mobile and Digital marketing. My creative side is fueled by lots of travelling and unwinding in the outdoors. Wow… This is amazing new feature. It will force us, procrastinators, to take action.